These highlights do not include all the information needed to use lansoprazole delayed-release capsules USP safely and effectively. See full prescribing information for lansoprazole delayed-release capsules USP. To report SUSPECTED ADVERSE REACTIONS, contact TEVA USA, PHARMACOVIGILANCE at 1-888-838-2872, X6351 or drug.safety@tevapharm.com; or FDA at 1-800-FDA-1088 or www.fda.gov/medwatch. Lansoprazole delayed-release capsules are indicated for short-term treatment (for 4 weeks) for healing and symptom relief of active duodenal ulcer [see Clinical Studies (14)] . Lansoprazole delayed-release capsules in combination with amoxicillin as dual therapy is indicated for the treatment of patients with H. pylori infection and duodenal ulcer disease (active or one-year history of a duodenal ulcer) who are either allergic or intolerant to clarithromycin or in whom resistance to clarithromycin isknown or suspected (see the clarithromycin package insert, MICROBIOLOGY section). Eradication of H. pylori has been shown to reduce the risk of duodenal ulcer recurrence [see Clinical Studies (14)]. Lansoprazole delayed-release capsules are indicated for short-term treatment (up to 8 weeks) for healing and symptom relief of active benign gastric ulcer [see Clinical Studies (14)]. Lansoprazole delayed-release capsules are indicated for the treatment of NSAID-associated gastric ulcer in patients who continue NSAID use. Controlled studies did not extend beyond 8 weeks [see Clinical Studies (14)]. 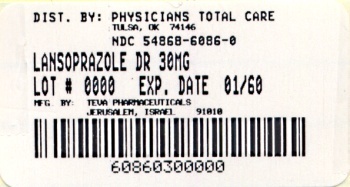 Lansoprazole delayed-release capsules are indicated for the treatment of heartburn and other symptoms associated with GERD [see Clinical Studies (14)]. Lansoprazole delayed-release capsules are indicated for short-term treatment (up to 8 weeks) for healing and symptom relief of all grades of erosive esophagitis. 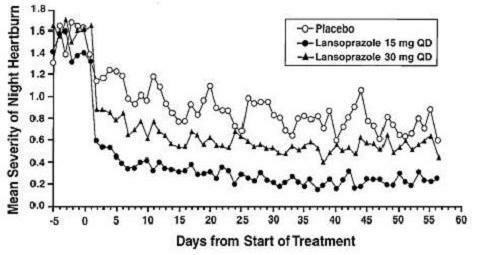 For patients who do not heal with lansoprazole delayed-release capsules for 8 weeks (5 to 10%), it may be helpful to give an additional 8 weeks of treatment. If there is a recurrence of erosive esophagitis an additional 8 week course of lansoprazole delayed-release capsules may be considered [see Clinical Studies (14)]. Lansoprazole delayed-release capsules USP are available in 15 mg and 30 mg strengths. Directions for use specific to the route and available methods of administration for this dosage form is presented below. Lansoprazole delayed-release capsules USP should be taken before eating. Lansoprazole delayed-release capsules USP SHOULD NOT BE CRUSHED OR CHEWED. In the clinical trials, antacids were used concomitantly with lansoprazole. Lansoprazole delayed-release capsules USP should be swallowed whole. Sprinkle intact granules on one tablespoon of either applesauce, ENSURE® pudding, cottage cheese, yogurt or strained pears. Sprinkle intact granules into a small volume of either apple juice, orange juice or tomato juice (60 mL â€” approximately 2 ounces). 15 mg are hard gelatin capsules, with a light-blue opaque cap and flesh-colored opaque body, imprinted with â€œ93â€ and â€œ7350â€ on the other side. 30 mg are hard gelatin capsules, with a light-gray opaque cap and flesh-colored opaque body, imprinted with â€œ93â€ and â€œ7351â€ on the other side. Lansoprazole delayed-release capsules are contraindicated in patients with known severe hypersensitivity to any component of the formulation of lansoprazole delayed-release capsules. For information on contraindications for amoxicillin or clarithromycin, refer to their full prescribing information, CONTRAINDICATIONS sections. Body as a Whole - anaphylactic/anaphylactoid reactions; Digestive System - hepatotoxicity, pancreatitis, vomiting; Hemic and Lymphatic System - agranulocytosis, aplastic anemia, hemolytic anemia, leukopenia, neutropenia, pancytopenia, thrombocytopenia, and thrombotic thrombocytopenic purpura; Metabolism and Nutritional Disorders â€“ hypomagnesemia; Musculoskeletal System- bone fracture, myositis; Skin and Appendages - severe dermatologic reactions including erythema multiforme, Stevens-Johnson syndrome, toxic epidermal necrolysis (some fatal); Special Senses - speech disorder; Urogenital System - interstitial nephritis, urinary retention. Lansoprazole causes long-lasting inhibition of gastric acid secretion. Lansoprazole and other PPIs are likely to substantially decrease the systemic concentrations of the HIV protease inhibitor atazanavir, which is dependent upon the presence of gastric acid for absorption, and may result in a loss of therapeutic effect of atazanavir and the development of HIV resistance. Therefore, lansoprazole and other PPIs should not be coadministered with atazanavir [see Clinical Pharmacology (12.3)]. Lansoprazole and other PPIs may interfere with the absorption of other drugs where gastric pH is an important determinant of oral bioavailability (e.g., ampicillin esters, digoxin, iron salts, ketoconazole) [see Clinical Pharmacology (12.3)]. In a study of healthy subjects, coadministration of single or multiple 60 mg doses of lansoprazole and warfarin did not affect the pharmacokinetics of warfarin nor prothrombin time [see Clinical Pharmacology (12.3)]. However, there have been reports of increased INR and prothrombin time in patients receiving PPIs and warfarin concomitantly. Increases in INR and prothrombin time may lead to abnormal bleeding and even death. Patients treated with PPIs and warfarin concomitantly may need to be monitored for increases in INR and prothrombin time [see Clinical Pharmacology (12.3)] . Concomitant administration of lansoprazole and clopidogrel in healthy subjects had no clinically important effect on exposure to the active metabolite of clopidogrel or clopidogrel-induced platelet inhibition [see Clinical Pharmacology ( 12.3)]. No dose adjustment of clopidogrel is necessary when administered with an approved dose of lansoprazole. The safety and effectiveness of lansoprazole have been established in pediatric patients 1 to 17 years of age for short-term treatment of symptomatic GERD and erosive esophagitis. In an uncontrolled, open-label, U.S. multicenter study, 66 pediatric patients (1 to 11 years of age) with GERD were assigned, based on body weight, to receive an initial dose of either lansoprazole 15 mg daily if â‰¤ 30 kg or lansoprazole 30 mg daily if greater than 30 kg administered for 8 to 12 weeks. The lansoprazole dose was increased (up to 30 mg twice daily) in 24 of 66 pediatric patients after 2 or more weeks of treatment if they remained symptomatic. At baseline 85% of patients had mild to moderate overall GERD symptoms (assessed by investigator interview), 58% had non-erosive GERD and 42% had erosive esophagitis (assessed by endoscopy). The most frequently reported (2 or more patients) treatment-related adverse reactions in patients 1 to 11 years of age (N = 66) were constipation (5%) and headache (3%). The safety of lansoprazole delayed-release capsules has been assessed in these 87 adolescent patients. Of the 87 adolescent patients with GERD, 6% (5/87) took lansoprazole delayed-release capsules for less than 6 weeks, 93% (81/87) for 6 to 10 weeks, and 1% (1/87) for greater than 10 weeks. No dosage adjustment of lansoprazole is necessary in geriatric patients. The incidence rates of lansoprazole-associated adverse reactions and laboratory test abnormalities are similar to those seen in younger patients [see Clinical Pharmacology (12.3)]. The lansoprazole delayed-release capsules USP for oral administration are available in two dosage strengths: 15 mg and 30 mg of lansoprazole per capsule. Each delayed-release capsule contains enteric-coated granules consisting of 15 mg or 30 mg of lansoprazole (active ingredient) and the following inactive ingredients: black iron oxide, gelatin, hypromellose, magnesium carbonate, methacrylic acid copolymer dispersion, propylene glycol, red iron oxide, shellac, sugar spheres (which contain sucrose and corn starch), talc, titanium dioxide, and triethyl citrate. Additionally, 15 mg capsule contains brilliant blue FCF - FD&C blue 1. The imprinting ink may contain potassium hydroxide. Amoxicillin pretreatment susceptible isolates (â‰¤ 0.25 mcg/mL) occurred in 97.8% (936/957) and 98.0% (98/100) of the patients in the dual and triple therapy clinical trials by E-test and agar dilution, respectively. Twenty-one of 957 patients (2.2%) by E-test, and 2 of 100 patients (2.0%) by agar dilution, had amoxicillin pretreatment MICs of greater than 0.25 mcg/mL. One patient on the 14 day triple therapy regimen had an unconfirmed pretreatment amoxicillin minimum inhibitory concentration (MIC) of greater than 256 mcg/mL by E-test and the patient was eradicated of H. pylori (Table 6). Patients not eradicated of H. pylori following lansoprazole/amoxicillin/clarithromycin triple therapy will likely have clarithromycin resistant H. pylori. Therefore, for those patients who fail therapy, clarithromycin susceptibility testing should be done when possible. Patients with clarithromycin resistant H.pylori should not be treated with lansoprazole/amoxicillin/clarithromycin triple therapy or with regimens which include clarithromycin as the sole antimicrobial agent. Susceptibility Test for Helicobacter pylori: The reference methodology for susceptibility testing of H. pylori is agar dilution MICs.1 One to three microliters of an inoculum equivalent to a No. 2 McFarland standard (1 x 107 to 1 x 108 CFU/mL for H. pylori) are inoculated directly onto freshly prepared antimicrobial-containing Mueller-Hinton agar plates with 5% aged defibrinated sheep blood (â‰¥ 2 weeks old). The agar dilution plates are incubated at 35°C in a microaerobic environment produced by a gas generating system suitable for campylobacters. Gender: In a study comparing 12 male and 6 female human subjects who received lansoprazole, no gender differences were found in pharmacokinetics and intragastric pH results [see Use in Specific Populations (8.8)]. Atazanavir: Lansoprazole causes long-lasting inhibition of gastric acid secretion. Lansoprazole substantially decreases the systemic concentrations of the HIV protease inhibitor atazanavir, which is dependent upon the presence of gastric acid for absorption, and may result in a loss of therapeutic effect of atazanavir and the development of HIV resistance. Therefore, lansoprazole, or other proton pump inhibitors, should not be coadministered with atazanavir. Clopidogrel: Clopidogrel is metabolized to its active metabolite in part by CYP2C19. A study of healthy subjects who were CYP2C19 extensive metabolizers, receiving once daily administration of clopidogrel 75 mg alone or concomitantly with lansoprazole 30 mg (n = 40), for 9 days was conducted. The mean AUC of the active metabolite of clopidogrel was reduced by approximately 14% (mean AUC ratio was 86%, with 90% CI of 80 to 92%) when lansoprazole was coadministered compared to administration of clopidogrel alone. Pharmacodynamic parameters were also measured and demonstrated that the change in inhibition of platelet aggregation (induced by 5 mcM ADP) was related to the change in the exposure to clopidogrel active metabolite. The clinical significance of this finding is not clear. In two 24 month carcinogenicity studies, Sprague-Dawley rats were treated with oral lansoprazole doses of 5 to 150 mg/kg/day, about 1 to 40 times the exposure on a body surface (mg/m2) basis of a 50 kg person of average height [1.46 m2 body surface area (BSA)] given the recommended human dose of 30 mg/day. Lansoprazole produced dose-related gastric enterochromaffin-like (ECL) cell hyperplasia and ECL cell carcinoids in both male and female rats. It also increased the incidence of intestinal metaplasia of the gastric epithelium in both sexes. In male rats, lansoprazole produced a dose-related increase of testicular interstitial cell adenomas. The incidence of these adenomas in rats receiving doses of 15 to 150 mg/kg/day (4 to 40 times the recommended human dose based on BSA) exceeded the low background incidence (range = 1.4 to 10%) for this strain of rat. In a 24 month carcinogenicity study, CD-1 mice were treated with oral lansoprazole doses of 15 to 600 mg/kg/day, 2 to 80 times the recommended human dose based on BSA. Lansoprazole produced a dose-related increased incidence of gastric ECL cell hyperplasia. It also produced an increased incidence of liver tumors (hepatocellular adenoma plus carcinoma). The tumor incidences in male mice treated with 300 and 600 mg/kg/day (40 to 80 times the recommended human dose based on BSA) and female mice treated with 150 to 600 mg/kg/day (20 to 80 times the recommended human dose based on BSA) exceeded the ranges of background incidences in historical controls for this strain of mice. Lansoprazole treatment produced adenoma of rete testis in male mice receiving 75 to 600 mg/kg/day (10 to 80 times the recommended human dose based on BSA). Lansoprazole has been shown to prevent the recurrence of duodenal ulcers. Two independent, double-blind, multicenter, controlled trials were conducted in patients with endoscopically confirmed healed duodenal ulcers. 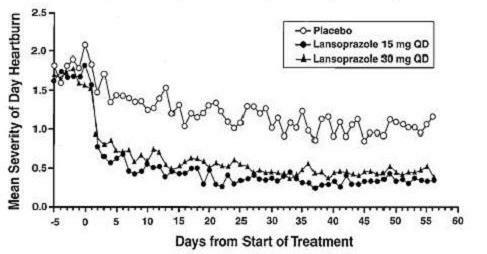 Patients remained healed significantly longer and the number of recurrences of duodenal ulcers was significantly less in patients treated with lansoprazole than in patients treated with placebo over a 12 month period (Table 13) [see Indications and Usage (1.3)]. 0 to 3 mo. 0 to 6 mo. 0 to 12 mo. In two U.S., multicenter double-blind, ranitidine-controlled studies of 925 total patients with frequent GERD symptoms, but no esophageal erosions by endoscopy, lansoprazole 15 mg was superior to ranitidine 150 mg (twice daily) in decreasing the frequency and severity of day and night heartburn associated with GERD for the 8 week treatment period. No significant additional benefit from lansoprazole 30 mg once daily was observed [see Indications and Usage (1.7)]. Two independent, double-blind, multicenter, controlled trials were conducted in patients with endoscopically confirmed healed esophagitis. Patients remained in remission significantly longer and the number of recurrences of erosive esophagitis was significantly less in patients treated with lansoprazole than in patients treated with placebo over a 12 month period (Table 21). Trial Drug No. of Pts. 0 to 3 mo. 0 to 6 mo. 0 to 12 mo. Advise patients to immediately report and seek care for any cardiovascular or neurological symptoms including palpitations, dizziness, seizures, and tetany as these may be signs of hypomagnesemia [see Warnings and Precautions (5.3)]. Lansoprazole delayed-release capsules SHOULD NOT BE CRUSHED OR CHEWED. ENSURE® is a registered trademark of Abbott Laboratories. Read this Patient Information that comes with lansoprazole delayed-release capsules USP before you start taking them and each time you get a refill. There may be new information. This leaflet does not take the place of talking with your doctor about your medical condition or your treatment. What are lansoprazole delayed-release capsules USP? Lansoprazole delayed-release capsules USP are a prescription medicine called a proton pump inhibitor (PPI). Lansoprazole delayed-release capsules USP reduce the amount of acid in your stomach. along with certain antibiotics to treat a stomach infection called Helicobacter pylori. for continued healing of duodenal ulcers. for 8 weeks to heal the acid-related damage to the lining of the esophagus (called erosive esophagitis) and to relieve symptoms, such as heartburn pain. If needed, your doctor may prescribe an additional 8 weeks of lansoprazole delayed-release capsules USP. for continued healing of erosive esophagitis. for up to 12 weeks to treat GERD and erosive esophagitis in children 1 to 11 years old. for up to 8 weeks to treat GERD and erosive esophagitis in adolescents 12 to 17 years old. Lansoprazole delayed-release capsules USP are not effective for symptoms of GERD in children under the age of 1 year. Lansoprazole delayed-release capsules USP may help your acid-related symptoms, but you could still have serious stomach problems. Talk with your doctor. Who should not take lansoprazole delayed-release capsules USP? Do not take lansoprazole delayed-release capsules USP if you are allergic to lansoprazole delayed-release capsules USP or any of its ingredients. See the end of this leaflet for a complete list of ingredients in lansoprazole delayed-release capsules USP. What should I tell my doctor before taking lansoprazole delayed-release capsules USP? are pregnant or plan to become pregnant. It is not known if lansoprazole delayed-release capsules USP will harm your unborn baby. Talk to your doctor if you are pregnant or plan to become pregnant. are breast-feeding or planning to breast-feed. You and your doctor should decide if you will take lansoprazole delayed-release capsules USP or breast-feed. You should not do both without first talking with your doctor. Lansoprazole delayed-release capsules USP may affect how other medicines work, and other medicines may affect how lansoprazole delayed-release capsules USP work. How should I take lansoprazole delayed-release capsules USP? Take lansoprazole delayed-release capsules USP exactly as prescribed by your doctor. Do not change your dose or stop taking lansoprazole delayed-release capsules USP without talking to your doctor first. You should take lansoprazole delayed-release capsules USP before eating. You should swallow lansoprazole delayed-release capsules USP whole. Do not crush or chew lansoprazole delayed-release capsules USP. If you have trouble swallowing a whole capsule, you can open the capsule and take the contents with certain foods or juices. See â€œPatient Instructions for Useâ€ at the end of this leaflet for instructions on how to take lansoprazole delayed-release capsules USP with certain foods and juices. See â€œPatient Instructions for Useâ€ at the end of this leaflet for instructions on how to mix and give lansoprazole delayed-release capsules USP through a nasogastric tube. If you miss a dose, take it as soon as you remember. If it is almost time for your next dose, skip the missed dose. Just take the next dose at your regular time. Do not take 2 doses at the same time. If you are not sure about dosing, call your doctor. If you take too many lansoprazole delayed-release capsules USP, call your doctor right away. What are the possible side effects of lansoprazole delayed-release capsules USP? Serious allergic reactions. Tell your doctor if you get any of the following symptoms with lansoprazole delayed-release capsules USP. Your doctor may stop lansoprazole delayed-release capsules USP if these symptoms happen. Bone Fractures. People who are taking multiple daily doses of proton pump inhibitor medicines for a long period of time may have an increased risk of fractures of the hip, wrist or spine. Your doctor may check the level of magnesium in your body before you start taking lansoprazole delayed-release capsules USP, or during treatment; if you will be taking lansoprazole delayed-release capsules USP for a long period of time. These are not all the possible side effects of lansoprazole delayed-release capsules USP. For more information, ask your doctor or pharmacist. How should I store lansoprazole delayed-release capsules USP? Store lansoprazole delayed-release capsules USP at room temperature between 20º to 25ºC (68º to 77ºF). Keep lansoprazole delayed-release capsules USP and all medicines out of the reach of children. General information about lansoprazole delayed-release capsules USP. Medicines are sometimes prescribed for conditions other than those listed in a Patient Information Leaflet. Do not use lansoprazole delayed-release capsules USP for conditions for which they were not prescribed. Do not give lansoprazole delayed-release capsules USP to other people, even if they have the same symptoms you have. They may harm them. This Patient Information Leaflet provides a summary of the most important information about lansoprazole delayed-release capsules USP. If you would like more information, talk with your doctor. You can ask your doctor or pharmacist for information that is written for healthcare professionals. black iron oxide, gelatin, hypromellose, magnesium carbonate, methacrylic acid copolymer dispersion, propylene glycol, red iron oxide, shellac, sugar spheres (which contain sucrose and corn starch), talc, titanium dioxide, and triethyl citrate. Additionally, 15 mg capsule contains brilliant blue FCF - FD&C blue 1. The imprinting ink may contain potassium hydroxide. Swallow lansoprazole delayed-release capsules USP whole. Do not crush or chew them. Sprinkle the granules on 1 tablespoon of either applesauce, ENSURE® pudding, cottage cheese, yogurt or strained pears. Open the capsule and empty the granules into a syringe. Do not break or crush the granules. Lansoprazole delayed-release capsules USP should not be used in foods or liquids not listed above.